Part Used & Method for Pharmaceutical Preparations: The tuberous roots are dug in autumn or spring. They are cleaned, cut into slices and dried in the sun. 1. Deficient blood syndrome manifested as sallow complexion, dizziness, vertigo, insomnia, early graying of hair and soreness and weakness in the lumbar region and knees. Fleeceflower root (Heshouwu) is used with Prepared rehmannia root (Shudihuang), Grossy privet fruit (Nuzhenzi), Wolfberry fruit (Gouqizi), Dadder seed (Tusizi) and Mulberry mistletoe (Sangjisheng). 2. Constipation due to dryness in the intestines. 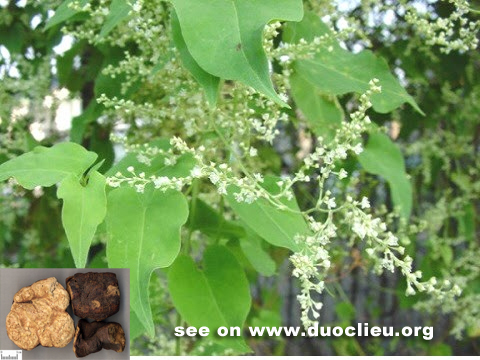 Fleeceflower root (Heshouwu) is used with Chinese angelica root (Danggui) and Hemp seed (Huomaren). 3. Chronic malaria due to weakness of the body. Fleeceflower root (Heshouwu) is used with Ginseng (Renshen) and Chinese angelica root (Danggui) in the formula He Ren Yin. 4. Scrofula. Fleeceflower root (Heshouwu) is used with Prunella spike (Xiakucao) and Tendrilled fritillary bulb (Chuanbeimu). Cautions & Contraindications: This herb is contraindicated in cases with severe phlegm-damp or diarrhea.